Crown rot is a common orchid ailment and is identified by droopy leaves breaking off at the base of the leaf. In advanced cases, the entire base of the orchid will turn black. 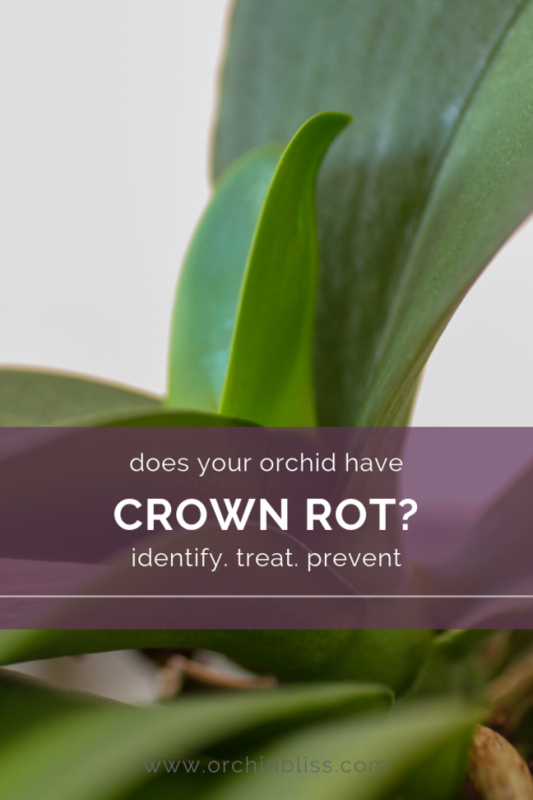 What is Orchid Crown Rot? Orchid crown rot occurs when water accumulates and lingers at the base of the orchid leaves. The good news is that you can easily treat crown rot with a product that you probably already have on hand – hydrogen peroxide. The crown rot in this case is too far advanced for saving. To prevent crown rot always be on alert for signs of overwatering. The well-meaning owner of this orchid placed ice cubes on the leaves of the orchid. When the ice cubes melted, water accumulated between the leaves resulting in crown rot. 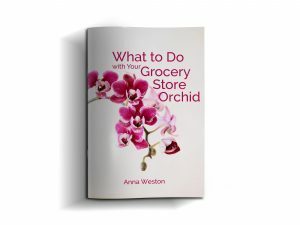 It’s time to get out your first aid kit, not for you, but for your orchids. 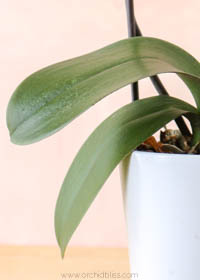 Pour a small amount of hydrogen peroxide over the affected area on your orchid. You will see the peroxide bubble up. That is normal. Repeat treatment every 2-3 days. Tip #1: Keep water from lingering at the base of the leaves. As the saying goes, an ounce of prevention is worth a pound of cure. Crown rot is easy to prevent. When watering your orchid try to keep water from accumulating at the base of the leaves. Avoid overwatering your orchid. 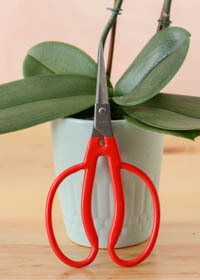 Pot your orchid in a well-draining potting mix and don’t let your orchid sit in water. After watering, I like to tip my orchid to the side to let any water that may be trapped between the leaves drain away from the orchid. Orchids need constant, but gentle air movement. In addition to preventing bacterial growth on an orchid’s leaves, a fan set to low, will also help prevent crown rot by facilitating evaporation of excess water. Tip #2 Be a savvy buyer and check for crown rot before you buy. When purchasing a new orchid, take a look at the base of the leaves. You can even give the leaves a gentle tug. If the leaves are not stiff and securely attached to the stem – keep looking. 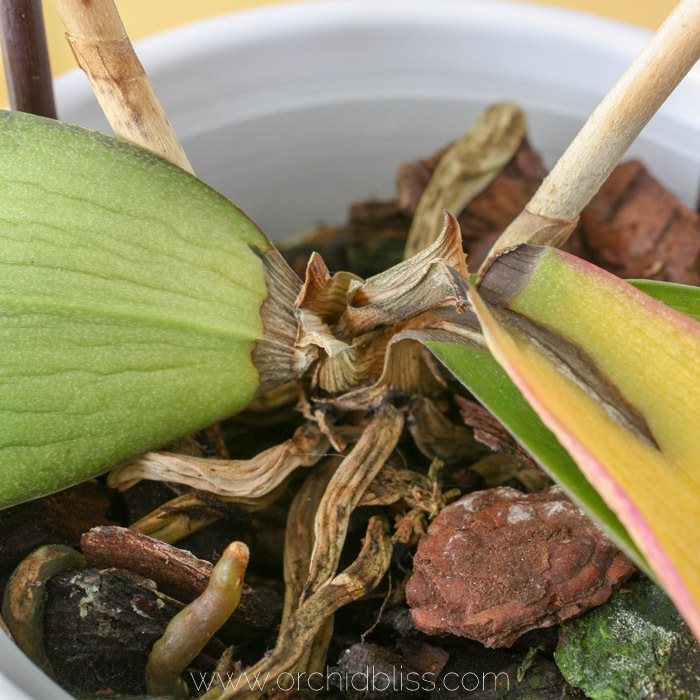 Sadly, once crown rot has advanced too far, the orchid may not be able to be saved, but if you catch it in time, the hydrogen peroxide treatment will work well at nipping root rot in the bud. Crown rot is 100% preventable. 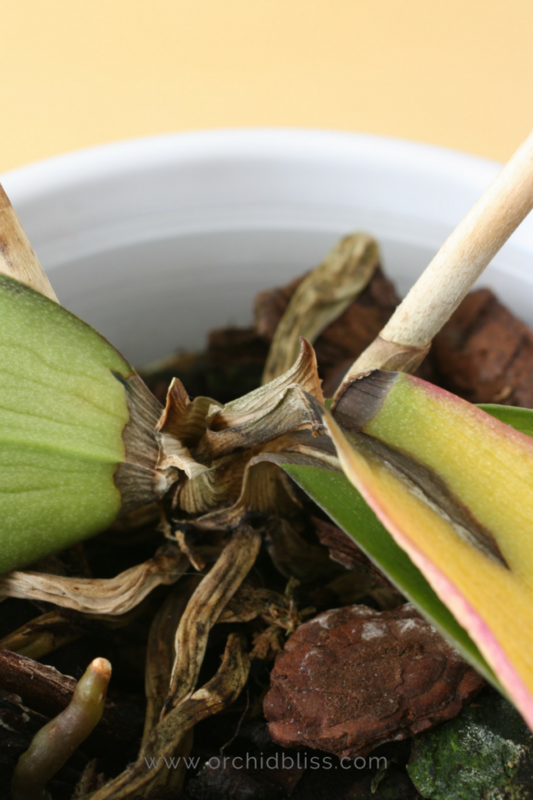 When watering, be aware of an orchid’s sensitivity to water accumulating between the leaves, and when buying a new orchid, be on the lookout for potential crown rot. 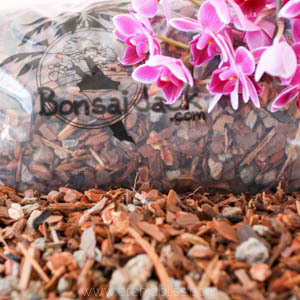 To provide additional moisture for Phalaenopsis orchids, add a bid of sphagnum moss to the bark mix. This will keep your Phals evenly moist – not too dry, and not too wet. If designer, hand-thrown pottery is more your style, I suggest Jolene’s Orchid Pots. As an orchid grower herself, Jolene creates elegant pots affording both form and function. Hi my name is Erica. I love all type of orchids. I have a few phal’s. I was battling to keep them alive. I’ve try different types of potting medium , bark chips and little bit of sphagnum mos. when I’ve found the right medium my biggest mistake was planting in too big pots. I’ve change most of my orchids to smaller pots , making from plastic cool drink bottles. When it is time to water, I put water in a jug and slowly put the plant in the water keeping the top above the water line, then I hold the pot for a minute. Then I lifted it and wait for the water to run out. Then to be sure I put my orchid on a dry towel, so that all traces of water will be absorbed by the towel. Thanks so much for sharing! We are in this together. Yes, orchid like to be underpotted. I also appreciate your watering tips. Thanks for mentioning my Orchid Pots. The crown for prevention and care will be USEFUL! I love your beautiful orchid pots! i have been given a rock orchid from my nanna. I am 70 yoa, that orchird has been in the same concrete pot as long as I can remember. It looks very crowded there. I am not a game to take it out of the pot. First of all, congratulations on your long-lived orchid! Your orchid does need to be repotted, and it will probably be quite difficult to remove it as I’m sure the roots have glued themselves to the pot. If you don’t want to do repot it yourself, you could ask a fellow orchid enthusiast with experience repotting. Often times orchid sellers repot orchids, and you could pay to them do it for you. I wish I could fly to Australia and repot your orchid – especially as you are heading into summer and I am headed for winter! How would I know if the crown rot is too advanced? My poor Orchid has been through the mill because of my lack of knowledge in properly caring for it and the improper care instructions attached to the plant when I purchased it. Wish I could post a picture. Thanks for your post! I appreciate the info. You could certainly email me a photo of your orchid: [email protected]. What I recommend is to wait and see. When watering your orchid use care not to get any water on the stem. Give it time and eventually, you’ll know. In the meantime, you’re not really out anything for trying.